If you are looking for an excellent house cleaning service, look no further. Sears Maid Services is experienced in cleaning all areas of a home or business. Whether is it a regular cleaning or a one-time cleaning, our locally operated teams are dedicated to providing the best cleaning services. Sears Maid Services cleans bathrooms, kitchens, hallways, living rooms, dining rooms, and offices! Give us a call at (619) 599-4870. Regular home cleaning services are scheduled so that they best fit your lifestyle and needs. Sears Maid Services offers weekly, bi-weekly and monthly cleaning schedules to accommodate homeowner and apartment owner cleaning needs. If you are selling a home or are a realtor putting a home on the market, Sears Maid Services offers a one-time Deep Cleaning to ensure that the home is ready for a showing or ready for the new family to move in right away. An intensive Deep Cleaning service covers all of our normal cleaning features along with additional attention to areas that are normally not required during everyday cleanings. The cleanliness of a business or office says a lot about the owner, the staff and the employees. If you want a successful business, Sears Maid Services can assist in making a great impression on customers by providing services to keep the office looking and smelling great! Customers will feel more comfortable and employees more motivated. Sears Maid Services allows you to focus on the important tasks rather than on the ability to maintain the cleanliness of the entire building. Call Sears Maid Services and let us worry about the bathrooms, dust, waste baskets and staff rooms. One of the most difficult duties during the post construction phase is the cleaning of all the dust and dirt particles that find their way to the smallest and hard to reach areas. Sears Maid Services is experienced in ridding homes of clinging dust particles and cleaning every room professionally and effectively. The sooner you call Sears Maid Services, the sooner clients or owners are able to take possession of the newly built structure. 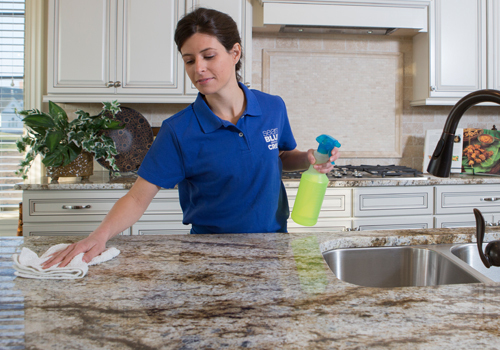 Here at Sears Maid Services, we understand that it can be very difficult to choose a trustworthy cleaning service. We pride ourselves on the screening process of each potential candidate. Each new employee will participate in multiple training sessions to ensure they are able to perform to the standards Sears Maid Services guarantees. We are confident that you will love the services that you are receiving from Sears Maid Services. If there is any problem at all with the services that were provided to you, simply contact your local Sears Maid Services team and describe the inconsistency within 24 hours of your last cleaning. We will send a trusted associate to your location whenever it's convenient for you. If the service was not performed to your satisfaction, we will return to correct the discrepancy at no extra charge to you.